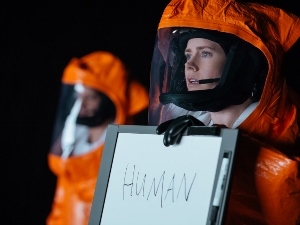 Amy Adams plays a linguist recruited by the military after aliens (the space kind) make first contact with human beings in twelve separate locations across the globe. Eric Heisserer’s non-linear screenplay (based on a story by Ted Chiang) and Denis Villeneuve’s austere direction make the first two-thirds of Arrival a pretty gripping film for people with the desire and ability to pay attention and get invested in a movie. This isn’t Independence Day and there are no battle scenes. The bulk of the film is spent inside one of the alien space ships, where Adams and co-star Jeremy Renner use math and linguistics to try understanding the aliens, who communicate in circular, symbolic ink blots that they draw in the air. Adams’ and Renner’s efforts are jeopardized by growing weariness on the part of the world’s military and a few home-grown terrorists in their midst. I’d be tempted to call Arrival a heady and (God forbid) smart film, except that it switches gears dramatically in the third act, bringing Hallmark sentimentality out of left field and elevating it front and center for easy tears. I was among the crying people in the audience, and you probably will be, too. Cheap tricks can work. I just thought this movie was above them. There’s also a huge scientific concept that overwhelms the narrative in the third act, requiring a little more suspension of disbelief than I could offer. Even with the problems I had with the movie, it’s still better than most of what you’re likely to see in the multiplex.